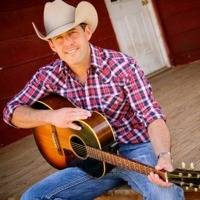 Aaron Watson is an American country singer. Watson was born in Amarillo, Texas and attended Abilene Christian University, where he began learning guitar, after playing junior college baseball in New Mexico. He gigged around Texas before releasing his debut album, A Texas Cafe; the follow-up, Shuttupanddance, was a regional sales success. His 2004 album, The Honky Tonk Kid, was produced by Ray Benson and features an appearance from Willie Nelson. Watson's band is called the Orphans of the Brazos; they appear on his 2005 album, Live at the Texas Hall of Fame. In 2006, his San Angelo release hit #60 on the U.S. Billboard country charts and #50 on its Heatseekers chart. Later that year, Watson released a collection of gospel songs entitled Barbed Wire Halo which includes readings by Billy Joe Shaver. On April 1, 2008, Watson's 8th album, Angels & Outlaws, reached #4 on the U.S. Billboard Heatseekers chart, #28 on its Country Albums chart, and landed in the The Billboard Top 200. The album's debut single, "Hearts Are Breaking Across Texas", reached the #1 spot on the Texas Music Chart. "Love Makin' Song" was released later that year, and "Rollercoaster Ride" followed in 2009. On September 15, 2009, Watson released Aaron Watson LIVE: Deep in the Heart of Texas, a dual disc CD/DVD set recorded live at the Hog Creek Ice House in Waco, TX on June 27, 2009. On July 7, 2009, Watson performed at the 81st Texas FFA Convention in Dallas, Texas. Watson and his wife Kimberly have two sons and one daughter, Jacob born in 2006, Jack born in 2007, and Jolee Kate born in 2009.